With new social networks launching everyday most start with the same basic features. Bloggers have WordPress, Mephisto, Typo and other open source solutions. Yet there isn’t an open source social network platform, until now. LovdByLess is an open source social network platform which is built with Ruby on Rails, this open source project has all the basic features you will need to setup a basic social network. You can follow a user, mutual following is friending. 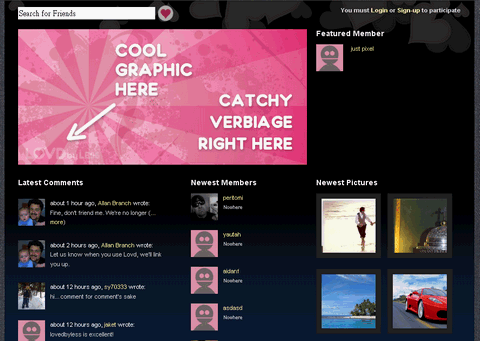 User-to-User Messaging, User Profile, Comments, Photo Gallery with Captions, Friends Search, Flickr and YouTube Integration as well. If you are going to build a social networking web application, LovdByLess is a really good platform to start with. However, you need to install Ruby on Rails first apparent. P.S. Thank you Evan pointed out that barnraiser.org is actually the first one of open source social software, that’s been around for a couple years now. Social bookmarking is a powerful tool in promoting a website. But going through all of those social bookmarking sites is very time-consuming and downloading all toolbars is madness! That’s where SocialMarker.com comes in, the free service designed to reduce the time and effort needed to socially bookmark a website. The only requirement is that you need to be using FireFox when socially marking.